The best laptop ever, yet again, hammers the competition in performance. XPS 13 ports: Controversy or not? Dell made a bold statement when it claimed its completely redesigned New XPS 13 would be among the fastest laptops in its class, if not the fastest. After finally laying our hands on the New XPS 13, we’d have to officially declare that Dell ain’t just trash-talking. How fast is it? Let’s just say the XPS 13 with an 8th-gen Core i5 is as fast, if not faster than, most 8th-gen Core i7 laptops. It’s even on a par with, or faster than, many larger, beefier laptops, too. But that’s not all. There’s way more to this redesigned XPS 13 that’s worthy of your attention. Before we get into the specs, we note that our first review unit exhibited odd issues, where it appeared to freeze. We shipped our first review unit back to Dell in exchange for a second one, which ran without issue. This happens with reviews on occasion (so no, not all review units are cherry-picked), and we mention it when it does. We should also say reviews of the New XPS 13 on Dell’s own website have been somewhat mixed, but new designs often see upticks in complaints. Our review is based on the second unit. The laptop measures 11.9 inches wide by 7.8 inches deep. 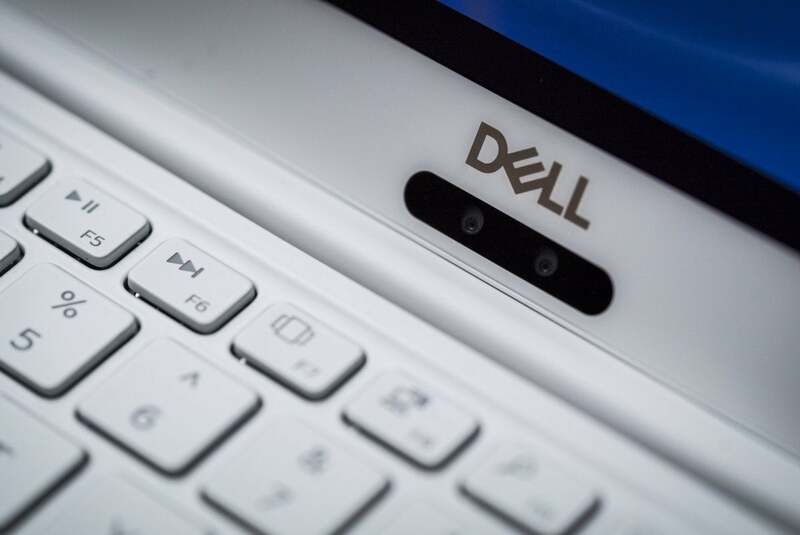 Dell officially puts the tapered body at 7.8mm to 11.6mm thick. Our calipers put it closer to 16.6mm at its widest, but the disparity comes down to just where you decide to measure it.That’s still a reduction from the previous versions’s 19mm. For weight, our scale put the New XPS 13 at 2 pounds, 10 ounces. Add its newer, smaller USB-C Power Delivery power brick (also in white), and it’s about 3 pounds, 2.2 ounces. The webcam moves from the far left side of the screen to the center and adds Windows Hello biometric face sign-in. The no-bezel InfinityEdge display that Dell’s featured in the XPS 13 since 2015 is mostly unchanged. The screen in this unit is a 1080p IPS panel that puts out a very bright 430 nits and features Corning Gorilla Glass 4 protection. There’s no touch option at this price, but Dell offers it on the 4K version. One noticeable change is the location of the webcam. The previous model put it in the lower left corner, which was better for viewing your left hand as you typed rather than your face. The New XPS 13 moves it to the middle but it remains low, which may annoy some users. On the other hand, we appreciate the long-overdue inclusion of an IR camera that supports Windows Hello face logins. Dell also embeds a fingerprint reader in to the power button. You’ll notice our particular model features its aluminum chassis in Rose Gold. More striking is the keyboard deck. Dell says the “Alpine White” finish, made of woven glass fiber, is designed to be extremely stain-resistant and won’t yellow from UV sunlight, either. Its faintly bumpy texture is distinct from the slightly rubbery black version. Dell says the Alpine White version of the New XPS 13 is very resistant to stains and yellowing from UV light. The keys are also slightly larger, which we appreciate. Although it looks the same, Dell has also improved the keyboard in the one area where the previous was lacking: size. While we always thought the travel was decent, the keys just felt a little cramped and small. The new version increases the key size about 1mm from 14.8mm to 15.8mm. It’s enough, for our fat nubs anyway, to feel a lot less cramped while typing. 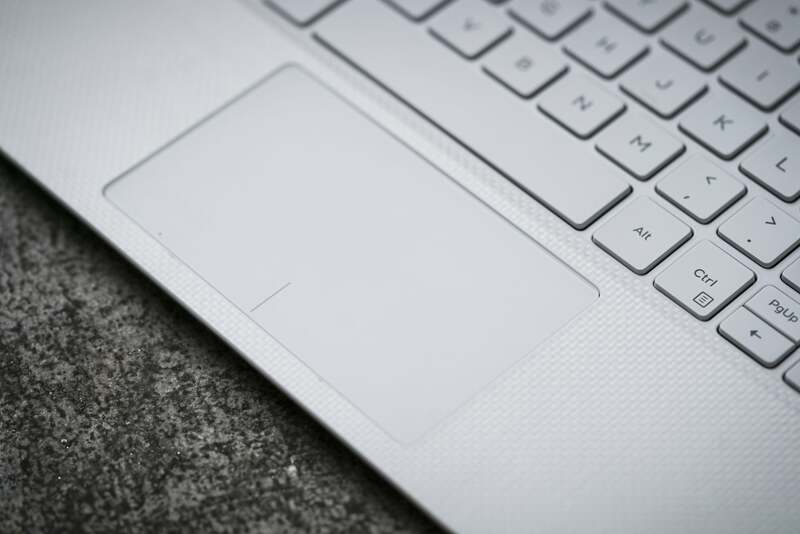 We’ve always been fans of the trackpad on the XPS 13. In this model, it’s a glass-smooth trackpad essentially identical to the prior model’s. It’s sized correctly (for our ham-fists) and has very good palm rejection. The New XPS 13 gives you USB-C, microSD, and headphone ports on its right side, stepping up from the previous model’s SD, USB-A and Noble lock port. The microSD sits flush enough so you could leave a card in there permanently. One area that’s likely to make people unhappy is the port selection. On the right side you get an analog audio port, a USB-C port and microSD port. The microSD port, we should mention, will hide all but 1mm of the card, so you could leave a card in for secondary storage if you wanted. 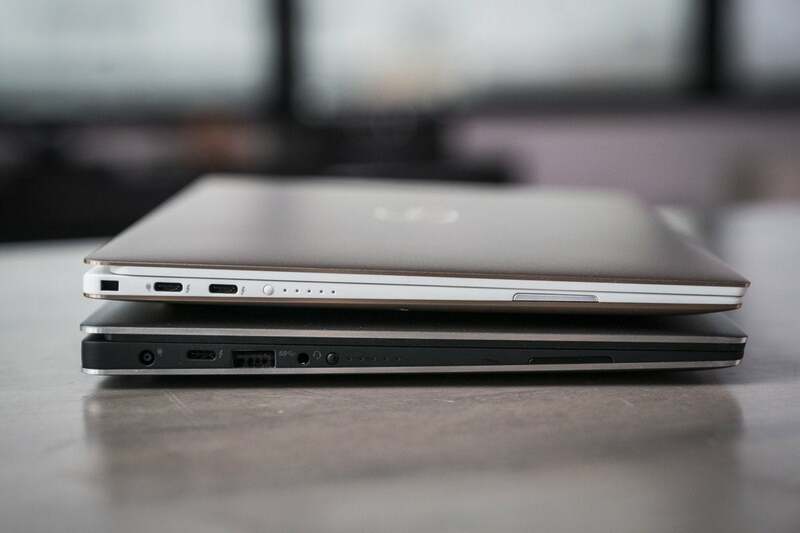 The left side features a Noble lock port and two 40Gbps Thunderbolt 3 ports (an upgrade from the 20Gbps versions on the older model). The right of the New XPS 13 (top) gives you a Noble lock port and two Thunderbolt 3 ports. 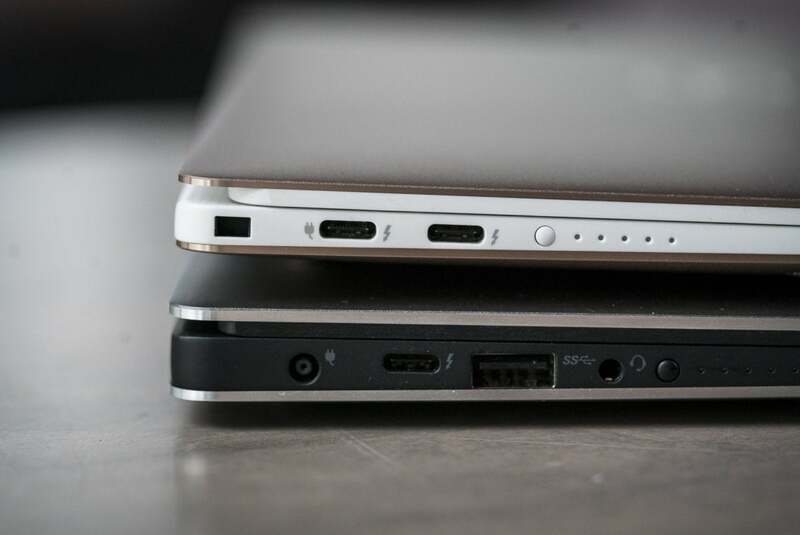 Compare that to the dedicated charger port, Thunderbolt 3, headphone port and—sniff—square USB-A on the previous model (bottom). If you noticed the lack of a square USB-A port, you’re not alone. Perhaps inspired by a certain Cupertino-based company’s success in taking things away from people, Dell follows suit. Frankly, it’s a big bummer. Consider that once you’ve plugged in the USB-C charger and an external monitor (after you’ve purchased a USB-C to HDMI or DisplayPort adapter), you’re left with only a single USB-C/Thunderbolt 3 port. Sure, you could buy a USB-C dongle or a Thunderbolt 3 monitor that does charging, USB and other nifty things, but that’s spending money. Dell also includes a matching USB-A to USB-C port dongle that we suspect most will lose within two minutes of opening the box. The New XPS 13 and its 8th-gen Core i5 is faster than the previous 8th-gen XPS 13 in multi-core tasks. The big deal with the New XPS 13 is its performance. We’ve known for some time that Intel’s nifty 8th-gen CPU depends on cooling to perform at its very best. We just haven’t seen one that lets the chip show its stuff—until now. Dell outfitted the New XPS 13 with dual fans and dual heat pipes (the previous model uses just a single-fan and single-heat pipe). You can see the beefier cooling in the image below. The New XPS 13 features beefier cooling to keep the 8th-gen quad-core Core i5 running at top speed. And yes, there is an industry standard M.2 that could in theory be upgraded later *cough* Apple. The cooling works, too. We used Intel’s XTU CPU stress test on the New XPS 13 for 45 minutes, and the XPS 13 ran between 3GHz and 3.3GHz. The previous XPS 13 stuck to 2.4GHz to 2.8GHz for the same run. XTU also shows that Dell has the New XPS 13’s chip set to run basically at 25 watts for most of the time, while the previous model had a limit of 15 to 17 watts. The tradeoff, though, is noise. Although under some loads, the New XPS was faster and quieter due to the dual fans, on flat-out runs, it was louder. We also found the New XPS 13 kicked up those fans far sooner than the older model did. To help keep the keyboard cooler, Dell outfits the New XPS 13 with a small strip of Gore thermal insulation. The idea is to help channel the heat away from the keyboard. 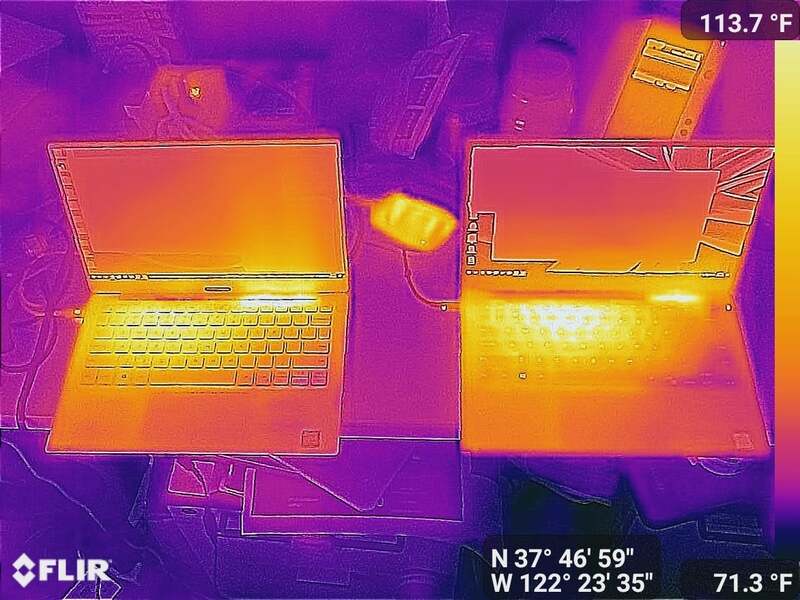 Subjecting the New XPS 13 to a Prime 95 stress test, we found the New XPS 13’s keyboard radiated less heat than the previous XPS 13 design did. Seen through a FLIR thermal imager, the New XPS 13's keyboard (left) was about 8 degrees Fahrenheit cooler than the previous generation's, despite being as fast or faster on multi-threaded loads. 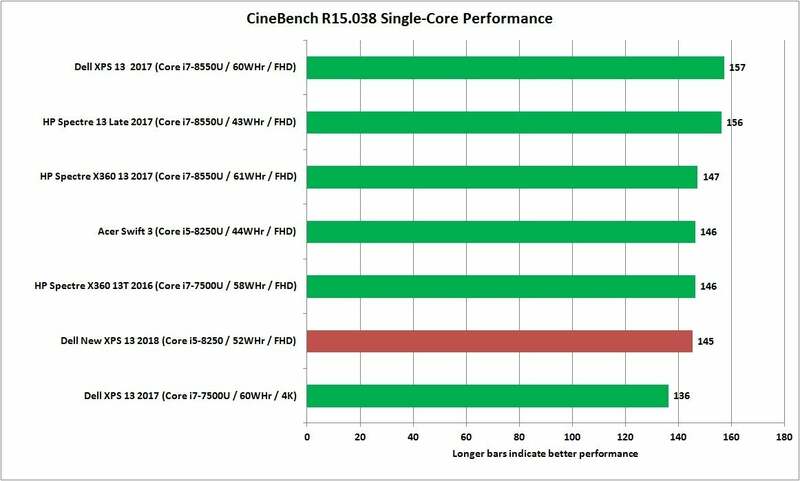 Our first performance test is Cinebench R15, which we ran in both single-threaded and multi-threaded modes. This 3D-rendering task is indicative of the kind of performance you might see from modern applications that truly use all of the CPU cores, such as content creation. Single-core or single-threaded performance might be indicative of more mundane tasks, such as Microsoft Word or Google Chrome, or other applications that rely more on higher single-core speed. Traditionally, the Core i7 has had an advantage in single-threaded loads, because Intel tunes these chips to give you higher speeds on burst loads. 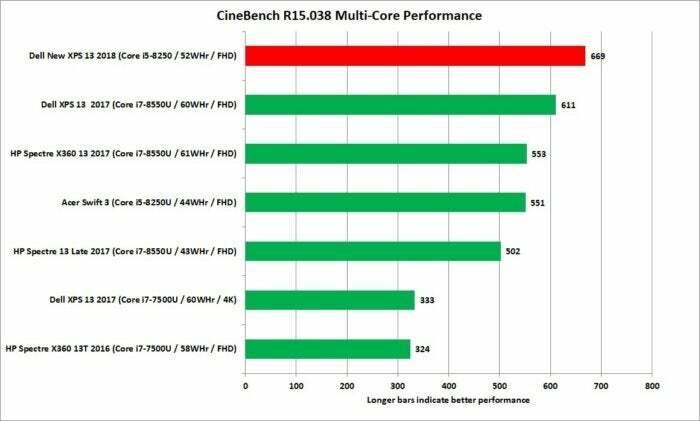 That plays out here, where we see the 8th-gen Core i5 falling about 8 percent behind the 8th-gen Core i7. 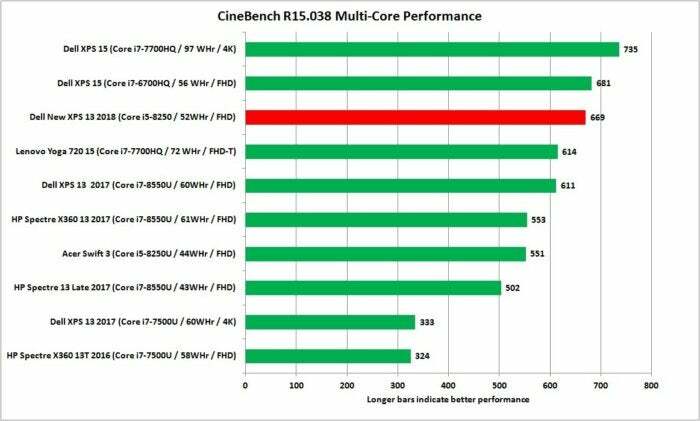 No matter how you cool it, a Core i5 that is set to a lower maximum clock speed won’t beat a Core i7 that can run at a higher clock speed. Where it all gets interesting is when you push all of the cores of a quad-core chip. The main advantage the Core i7 has is short-term boost speed, which goes away once it heats up. As you know, the New XPS 13’s cooling lets it run flat-out much longer. In Cinebench R15, we now see it leaps to the front, where it easily outpaces the 8th-gen Core i7 laptops. We’d argue that if you truly need a quad-core CPU, then you’re probably buying it for heavy duty tasks. That gives the advantage to the New XPS 13. In multi-threaded loads, once the boost runs out on the Core i7 laptops, the New XPS 13 and its beefy cooling puts its Core i5 in front of all others. Even though Cinebench R15 is a multi-threaded test, it runs in as little as a minute or two and doesn’t truly heat up a laptop enough to see a long-term performance hit. For that we use the popular and free HandBrake to convert a 30GB file using the Android Tablet preset. The task can take anywhere from less than an hour to several hours, depending on on the laptop. 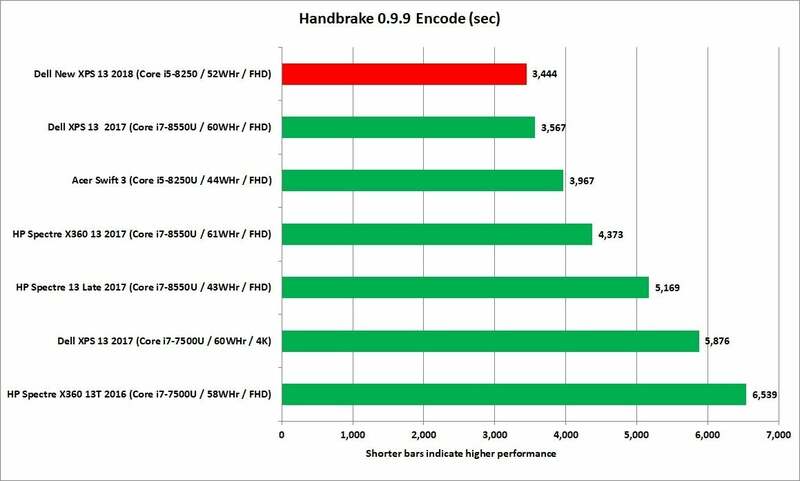 In the age of dual-core laptops, we never considered HandBrake a true performance test, but as more of a thermal torture test. 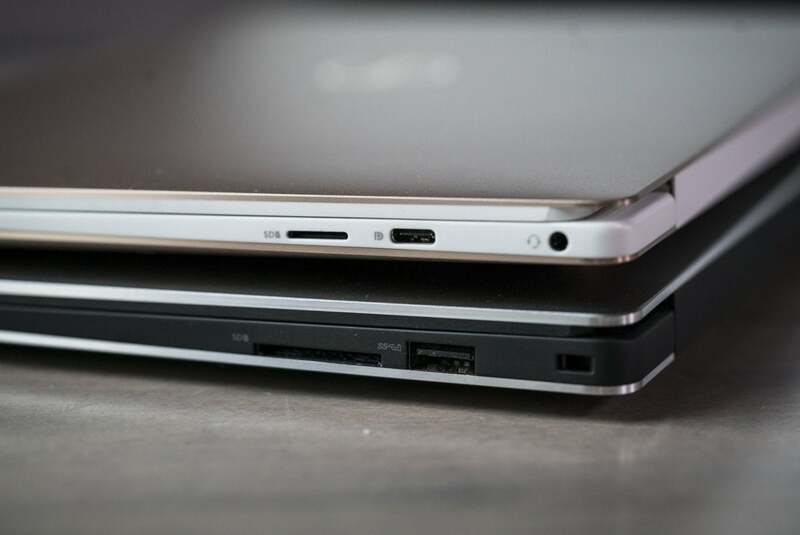 With today’s ultrabooks packing quad-core chips, we expect people to do content creation creation tasks that used to be left to larger, heavier laptops. 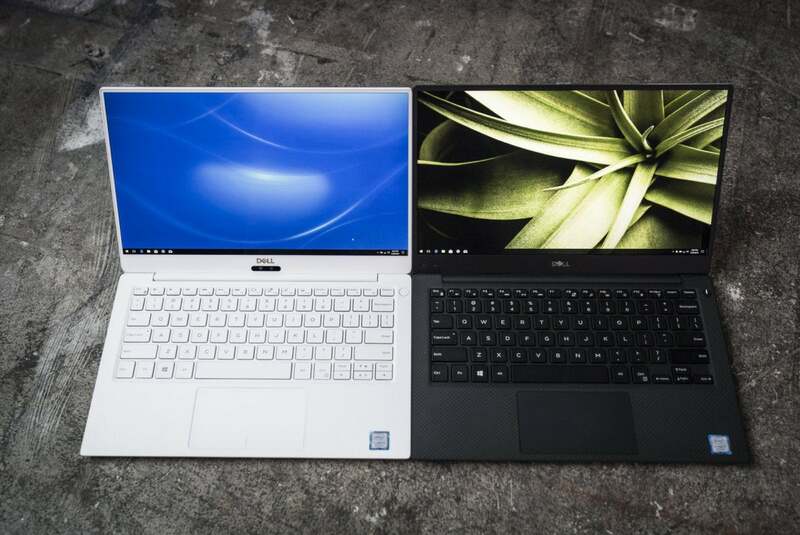 The result of this harsher test shows a close tie between the New XPS 13 and the previous XPS 13 design. The thing to remember is the New XPS 13 is a Core i5, while the previous-gen XPS 13 is a Core i7. Compare the New XPS 13's score to the score from the Acer Swift 3, a somewhat larger 14-inch laptop with a similar Core i5-8250 in it. It's no contest. Our HandBrake test challenges the cooling capabilities of the laptops. When it comes to gaming performance, Intel integrated graphics is integrated graphics. The good is that you can truly play some games if you have realistic expectations on the IGP. The New XPS 13 comes out in front, but not by much. 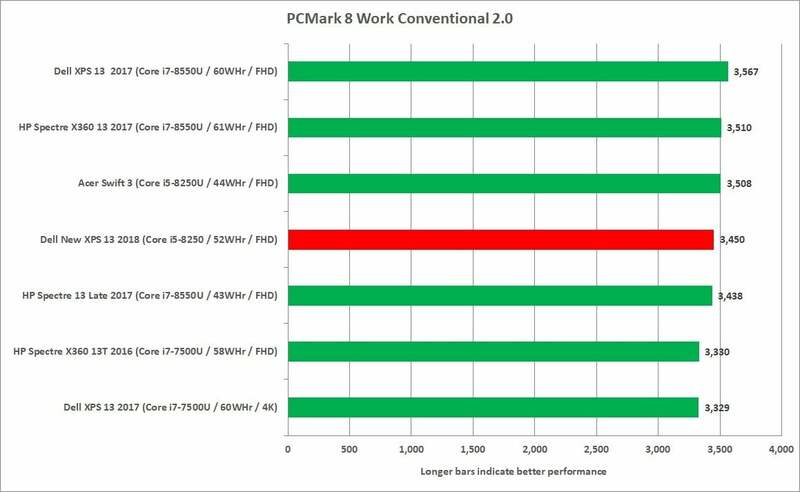 Notice, too, that 7th-gen laptops in this chart keep up surprisingly well. 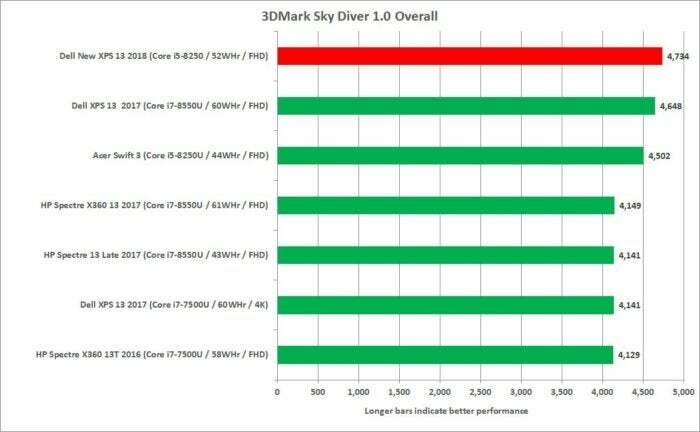 The 3D performance of the New XPS 13 leads the pack, though not by much. As much as we were impressed by the performance of the New XPS 13, we still want to remind those who mostly run a browser along with an Office application or two that for such tasks, this laptop is overkill. PCMark 8 Work Conventional simulates performance across everyday tasks: document editing, browsing websites, and videoconferencing with colleagues. As you can see from the results, it’s basically a tie. Go on price, keyboard, trackpad, weight, battery life, screen quality, or even color, rather than CPU. If all you do is push a browser, edit documents or do some videoconferencing, pay no attention to the CPU. For the New XPS 13, Dell actually had to reduce the battery capacity from the previous model’s 60 watt-hours to 52 watt-hours to accommodate the additional fans and thinner body. If 15 percent sounds like a lot, it is. Dell claims optimizations elsewhere in the laptop mostly make up for it. 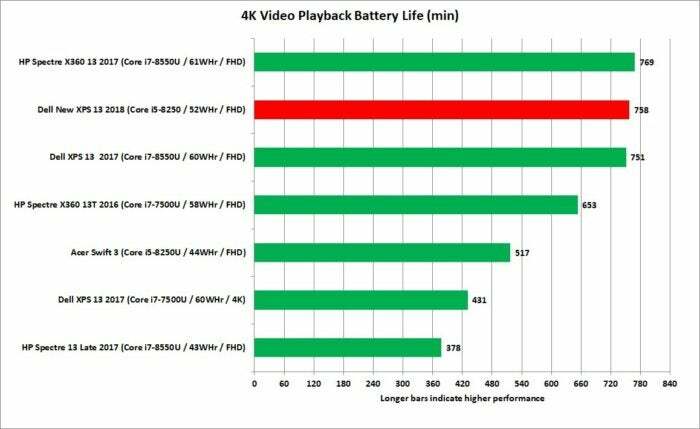 To test it, we played a 4K video file using Windows 10’s Movies & TV player while the laptop was in airplane mode, with a pair of earbuds attached. The screen brightness was set to a moderately bright 250 to 260 nits, and we basically ran it from full until dry. Dell’s claim, at least in our test, turned out to be true. Both the New XPS 13 and the previous gen lasted about 12.5 hours, meaning the new model does the same with less. We do want to note that video rundown tests in the age of modern CPUs are a cakewalk. Web browsing is actually more of a battery drain, but that's a hard test to replicate for comparability. Despite its smaller battery, the new XPS 13 actually lasts about as long as the previous generation did. 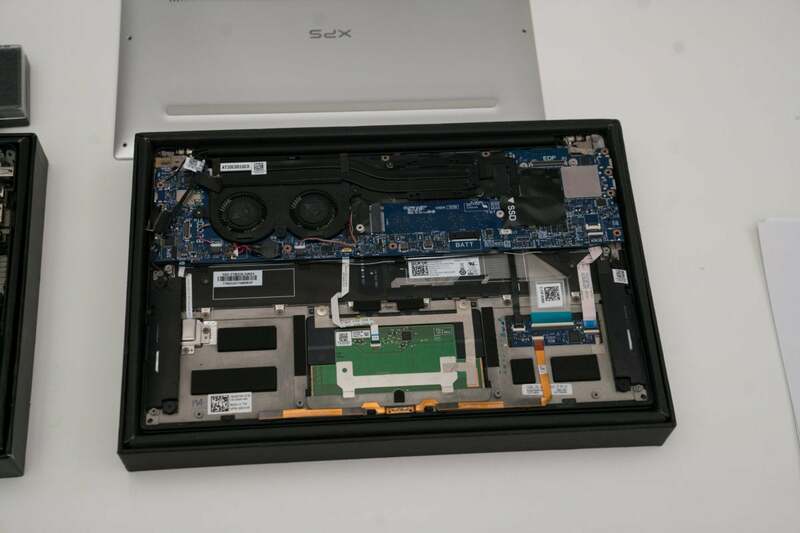 From our experience with the second unit, we can definitely recommend the New XPS 13. With its slightly improved keyboard, Windows Hello support and amazing performance, it would be difficult not to. Let’s just say this again in case you didn’t read our review: the New XPS 13 with a Core i5 is generally faster than other laptops with Core i7 chips in them. That’s simply unheard-of. If you really want to be amazed, we also compared it to larger, heavier 15-inch quad-core laptops, and it’s just as impressive. In the chart below you can see the New XPS 13 is performing awfully close to the Dell XPS 15, with its much hotter Core i7-6700HQ, and actually outperforms the Lenovo Yoga 720 15 with a Core i7-7700HQ in it. That’s simply crazy, and it says much about what Dell was able to do with one of the smallest 13-inch laptops in town. The tiny New XPS 13 is fast enough to compete with larger 15-inch laptops with 45-watt quad-core CPUs in them! Dell's New XPS 13 is slightly thinner, slightly lighter and a whole lot faster. With higher performance cooling, this Core i5 is easily as fast or faster than many Core i7 laptops. Add to it a Windows Hello camera, luxurious Alpine White keyboard deck and great battery life and you have a laptop that still sets the bar for how its done.